One of your options for adding movies to your presentation is to incorporate the movie right on a slide within your presentation. This tutorial shows how. Open your presentation in PowerPoint and go to the slide where you want your movie to appear. 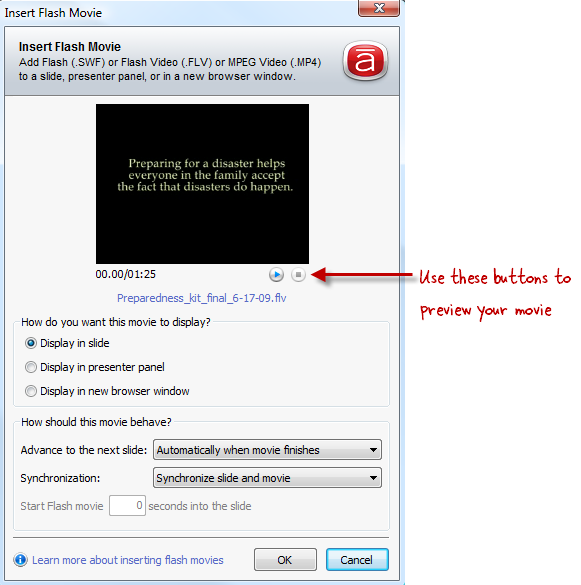 Select Flash Movie from the Articulate menu. Browse to the movie you want to insert. Presenter can use .mp4, .swf, and .flv files. When you find your file, click Open. A window pops up where you can customize the properties of your movie. You can also preview the movie here — just click the small blue play button under the movie's thumbnail. Choose Display in slide. This means the movie will play right on the current slide of your presentation. Automatically when movie finishes: This'll cause your presentation to advance to the next slide on its own when the movie's done playing. If any narration or animations on the slide extend beyond the end of your video, the slide won't advance till those finish too. When user clicks next: This means the user will need to advance the slide themselves — it won't happen automatically. Synchronize slide and movie: This is the best choice for movies that have a clear start and end, such as most videos and screen recordings. When you insert your video, Presenter adjusts your slide length to accommodate the length of your movie. If a user clicks the play/pause buttons or the seekbar on your player, this will control playback of both your presentation and the inserted movie. Movie plays independently of slide: If your movie contains lots of interactivity and clickable options, this is the best choice. If you choose this option, you can also set a buffer time in the Start Flash movie field to delay the appearance of the movie on the slide by however many seconds you choose. Click OK when you're done. Next time you publish, your video will play in the slide where you inserted it. Presenter inserts the movie onto your slide, and now you can adjust its size or position if you like. Just select it and scale it to a smaller size (hold down the Shift key while you scale, to maintain the movie's aspect ratio), or drag it to a different spot on your slide. Keep in mind that if you scale a movie’s native size to appear larger on your slide, the video quality won’t be as good. Also keep in mind that your movie will always sit on the top layer of your slide—it'll play on top of any other objects you've inserted on your slide. Can I Insert Multiple Movies on the Same Slide? Kind of. The slide itself can only contain one movie, but you can add up to two more movies to this slide: one in the presenter panel, and another that opens in a separate browser window. The tutorials listed below provide more info.